In response to Alliance of Civiliations’ call for greater intercultural dialogue, and to support the culture of peace, an agreement was signed by Dr. Aly Elsamman, President of the Union for Intercultural and Interfaith Dialogue and Peace Education (ADIC); Mr. Enrique Gaspar, president of Nexos Alianza, the media arm of the Foundation for Alliance of Civilizations, part of the United Nations; and Mr. Manuel Palacios Sanchet, president of Parque International de la Paz Euromediterraneo. Presented by the Deputy Speaker of the Parliament of Córdoba, Mr. Fernando Expósito, the agreement provides for the three signatories to promote the spirit of moderation and centrism. This spirit has been enjoyed in Egypt and in Córdoba, both places known for their historical models of coexistence, tolerance and culture of peace. Considering that the world, with conflicts and hate reigning in many regions, needs an example to which people can refer to find peace and love. Considering that Dr. Aly Elsamman launched a call to action from Cairo underlining the importance, in the past as well as today, of the model of Andalusia for the coexistence of all religions, and for there to be, “a Córdoba in every country.” This call to action was repeated on November 3, 2009 by the satellite television station Al Hayat and spread throughout the Arab world and the Middle East by the television channel 1 in Egypt; by the largest Egyptian newspaper, Al Ahram; and by Arab and Muslim communities throughout the world. Considering that President Barak Obama, in his speech delivered on June 4, 2009 from the amphitheater of the University of Cairo, honored the tolerance practiced in historic Andalusia through the model of Córdoba. Considering also that the Parque International de la Paz Euromediterraneo ennobled economic, financial and material values by aligning them with the improvement of people’s lives, and to support projects that serve peace and cultural dialogue. This choice, made by such a distinguished organization, is intended to become a model for other economic and financial organizations. 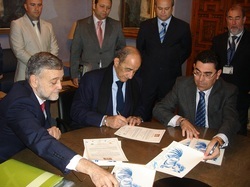 The three parties to this agreement decided to initiate several programs to first, promote relations between Andalusia, especially Córdoba, and Egypt, and second, promote relations between other Arab and European countries.